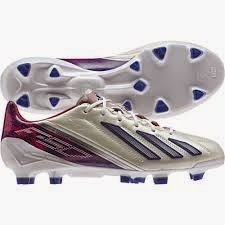 Football boots emerged as an essential part of the sport. Contemporary pictures of amateur teams (circa 1870) display a mixed bunch of rugged work boots. Not until the last decade of the century do teams appear to wear the same boots. The only regulation governing boots relates to anything that may endanger their opponents. Rule 13#: No player shall be allowed to wear projecting nails, iron plates, or gutta percha on the soles or heels of his boots. Newspaper reports indicate the weather in the winter of 1870/71 was severe and extreme. Heavy rain accompanied by high winds with severe frosts and snow did not deter the new game from being played. Flooding frequently arose followed by an unusual hot summer which pioneering players took in their stride but boots and ball got progressively heavier as wet conditions prevailed. Clothing was restrictive and worn for protection from the elements as much as decency. Early British football was very slow and not yet a spectators' spectacle. The game was considered more for participants and the general public was not actively encouraged to attend. 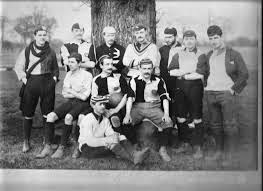 Despite this the popularity of football grew and clubs began to spring up across the UK. Early photographs are testament to the availability of stout footwear (Denvir, 1979). 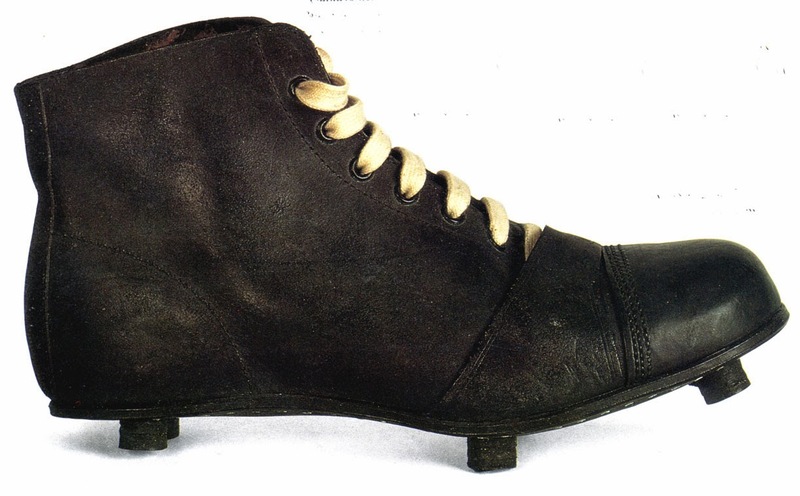 Players wore long laced boots, similar to engineer's boots but with a strengthened toecap in iron hard leather. In 1880 boots began to incorporate a strap, narrow on the inside of the foot, which crossed over the bottom two or three rows of eyelet's, winding to the outside of the foot. This gave greater protection to the toes as players used the dorsum of the foot to kick. Today, players use the side of their foot to strike the ball but then the toe was used to catch the ball and give it lift. To increase ground grip the soles incorporated metal tacks but Rule 13 prevented these in official matches. 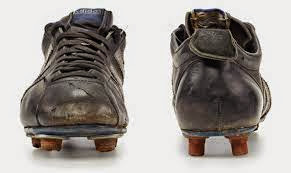 They were replaced in 1890 with new plugs made from layers of leather and the idea came from hockey boots. Studs (sometimes referred to as cleats) were positioned to avoid isolated pressure points and unnecessary irritation of the foot. In the area of the hindfoot they were located towards the outside of the sole to avoid buckling. The common formation was six studs, two distal and proximal to the metatarsal heads and two on the posterior aspect of the heel. 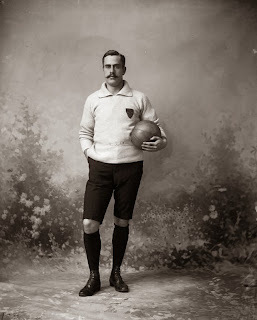 By 1900 the soccer boot was a recognisable entity and not just modified footwear adopted from other sports. The Shurekik Boota was made from russet calf with fluted toecap and sold in 1901 for a cost 8/6d ($1.26A). In 1925, makers began to include removable studs to the boot design. To complete leg protection shin guards cost between 1/6d (22c Aus) and 2/11d (45c Aus); and football hose varied between 1/11d (30c Aus) and 4/11d (75c Aus). Professional players received 2/6 (37c. Aus) per game and some were paid special bonuses in addition depending on their skill. The sum varied according to the size of the crowd but even the best players seldom got bonuses over 2/11 (45c Aus). Boots cost three times that amount. According to Morris (1981) 'baggy shorts and heavy boots" style remained the dominant costume theme, right up to the Second World War. Most authorities agree changes to football boots took place after the war when there was a dramatic increase in international fixtures. This was made possible by improved air travel and transcontinental travel brought soccer players from the colder climes of Europe into contact with their counter parts in the Mediterranean and South America. Warmer climates meant players wore less and had flexible boots more suited to the climate. The Latin game was played faster and provided opportunity for athleticism rarely seen in the traditional European game. Radio broadcasts then televised sport meant more spectators could appreciate the novel Latin styles and appreciation of their skills caused a revolution in play and clothing. 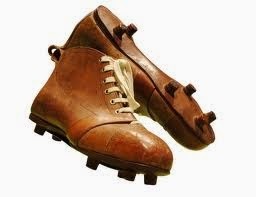 Boots became sports shoes allowing players to become athletes capable of leaps and volleys never before seen. The complete focus for design of the soccer boot was aimed at kicking and controlling the ball on the ground. (Lees & Nola,1998). Some might argue this has been at the expense of preventing injury. As the ankle boot lowered to become a soccer shoe alternative methods of providing ankle stability were necessary (Lees and Nolan, 1998). Later with the introduction of artificial playing surfaces the need for long studs became redundant. Deep penetration was neither good for the surface nor advantageous to the players, with many poor performances and injuries reported. At the same time the popularity of indoor soccer necessitated a change in boot design. The new challenges meant boot designers overcame the need to give players greater stability as their legs anchored to the floor combined with the need to cope with the rigours of sliding on the floor. The new soccer shoe had bristle (or cleat) soles and gradually these have been incorporated into the traditional soccer boot design. Marketing rhetoric may infer a revolution in recent years but the trend has been a steady evolution in design and materials as manufacturers have sought to improve safety and performance. Improvements in the last decade have covered a broad range of design changes from the shape of the shoe to new lacing systems (Martin, 1997). As women¹s soccer gained greater popularity, companies like Adidas carry different soccer shoes, developed on the shape and function of the female foot. To improve comfort, midsole cushioning now incorporates visco-elastic polymers. These are light in weight extremely resilient and hard wearing materials which incorporate fluids and gas within a solid mass. Not of this world these synthetics have come from the aerospace industry. These in turn displaced the revolutionary polyurethane which were originally used instead of natural rubber foams and leather. Changes from split sole shoe design have given greater support through the midfoot without loosing the need for shoe flexibility in accelerated movements. Changes in lacing and eyelet mechanisms make the hitting surfaces flatter against the foot. This has two benefits i.e. pressure is distributed across the top of the foot and the flatter surface helps the player control the ball. Side eyelet fixation is another design innovation considered to contribute to the above. Better grip is affected by the inclusion of neoprene sleeves around the throat of the boot.